We briefly distract you from your wool related activities to share a morning foray into the garden. 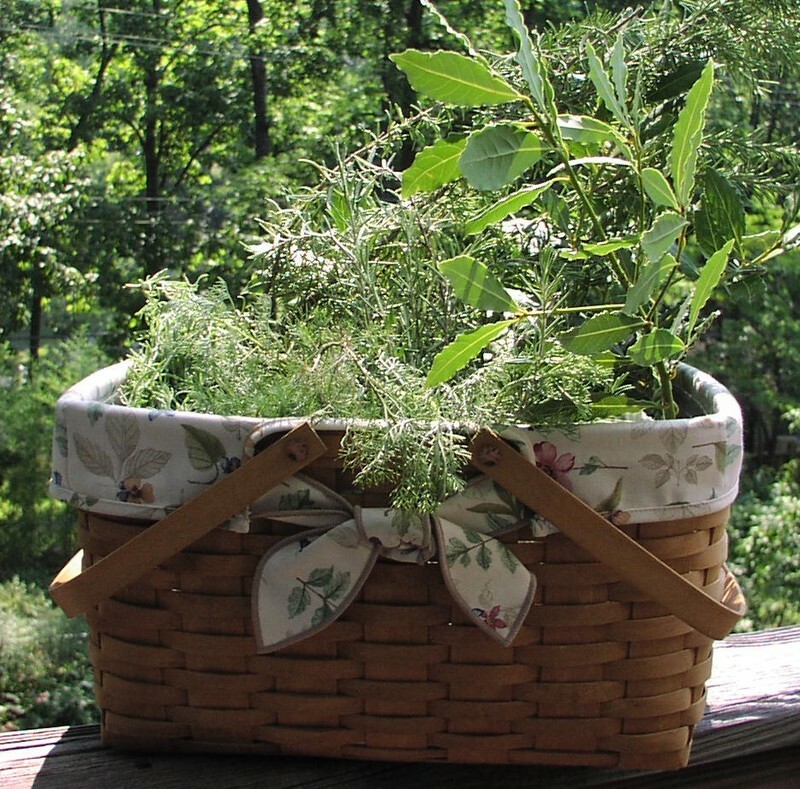 A mixture of my favorite herbs, (yes, that is a branch from my bay tree, grown from a 4" cutting, in the back of the basket. I was told they would not grow in Alabama and have never seen another one here, but I was determined to have one), but what does this have to do with knitting you ask? 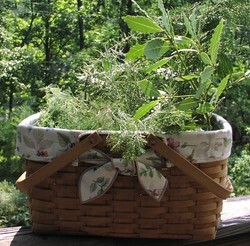 The herbs have been stripped from their slender branches and are carefully drying under tents. Once they are fully dry, they will become drawer and basket liners to keep my precious wool safe from the noxious moths who are particularly drawn to the hot humid regions of our house known as closets at this time of year. 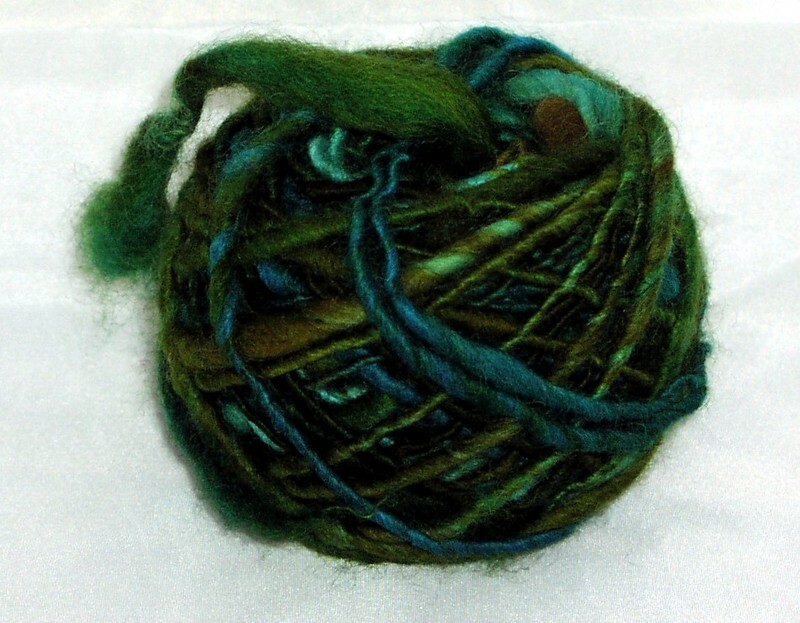 I dyed some yarn in a copper patina colorway yesterday, to go with some of the handspun I shared with you last week (a picture of the first ball is down below). The colorways are working out perfectly, so that the handspun, which is a thick and thin with an almost thrum effect in places, can be used as an accent with the newly dyed yarn. It has been one of those perfectly lovely summer days here. At lunch, I had time for a quick trip to eat lunch with my daughter at the museum (summer art camp) and got to take a look at one of my favorite pieces in their collection, an installation of enormous glass flowers by Chihuly, which never ceases to make me feel really, really happy. Tonight, while my darling husband watched bad horror movies, I sat down to spin and immediately found myself in the company of my two youngest children. They both spun with me for a while, before one dashed off to do pirouettes and the other stashed a spindle down the back of his shirt (are you sensing a theme here? the spindle became his most recent effort to find a weapon to sheath down his back ala Lord of the Rings). 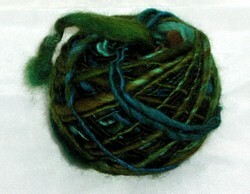 This roving is so gorgeous i have got to share it with you, even though this is a late night, bad lighting picture. 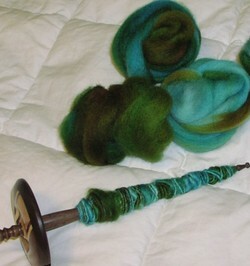 I love copper patina as a colorway, and this roving captures it pefectly. The yarn is spinning up nicely and I'm excited about it. All of the roving has been picked over and prepped for spining, so I'm hoping to make lots of progress with it this week. Because all my art friends are wondering if I have forsaken them for the demon knitting gods, I'm going to do something I don't usually do and share three collage works in progress. I thought it might be fun to show them now -- you can exhale a collective gasp at how awful they look in progress and it will be fun to see them when they are finished and no longer cause my inner art critic to want to stab something. Those three little words make me so happy. Blue ... Faced ... Leicester. If fate was ever kind enough to stick me out in the country on a little farm, I believe I would have a small flock of these lovely sheep. Until that time, I'm fortunate enough to have a very nice friend, Julie, whose lovely store has fabulous hand-dyed rovings and other cool things I covet. Last week, as I was leaving town on business, a package arrived from Julie's store. I stuck it in the car and promptly forgot about it. I discovered it again (while sitting in the parking lot at the Starbucks in Anniston, Alabama) and opened it to discover too huge bags of gorgeous starburst-y bright oranges and reds. It was so wonderful that I had to call Julie on the spot and tell her how much I loved it and ask what else she had in stock. So today, in the mail, I get a second package full of blues and greens, with a note that says, keep what you like and send the rest back (she'll pay postage) and I'll send you an invoice. I've already pulled the blue/purple apart and started prepping it to spin. Look at those colors! 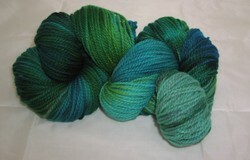 I'm thinking about spinning this with the oranges and reds to make a wonderful thick and thin multicolor yarn. 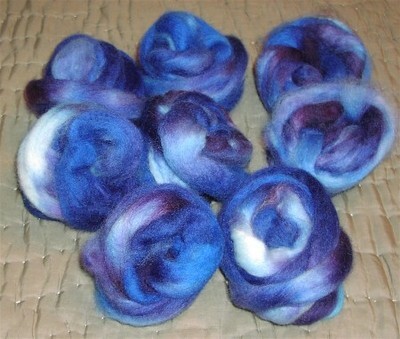 I just love the colors and the incredible softness of the Blue Faced Leicester roving.